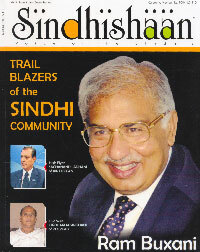 This is to congratulate you on the editing and publishing of a beautiful magazine "Sindhishaan". I had invited Dr Baldev Matlani and Hiro Thakur to attend the 22nd Annual Convention of the Sindhi Association of North America in Toronto, Canada in July this year and also to speak at the Sindhi Literary Session during the Convention. Both of them were kind enough to have accepted the invitation. Their papers were much appreciated by the audience. Dr Baldev was kind enough to give me a copy of your magazine. I was impressed by the quality of the magazine. It is great that you are carrying on the flag of Sindhiat in India. He also mentioned that you are very active in the community in India. I hope you would keep it up. I also hope you would attend one of our annual conventions. Next year we would be holding our Convention in Orlando, FL in the first week of July.